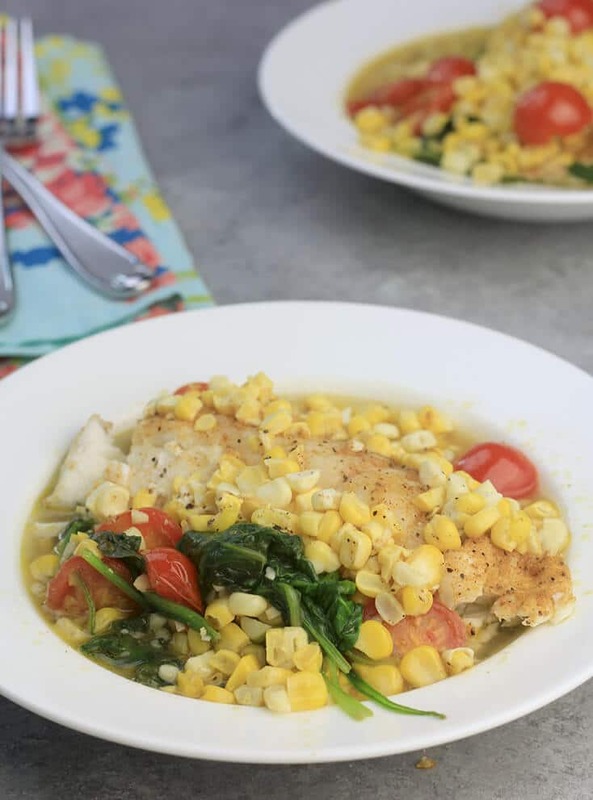 Fresh summer vegetables like spinach, corn, and tomatoes will make this easy oven baked fish one of your weeknight favorites! Don’t you love summertime when so many vegetables are abundant and fresh? My favorites are tomatoes, okra, and corn. And butter beans! Oh heck, I love ALL the summer vegetables! What’s your favorite? The trouble with having so many fresh options is trying to figure out what to do with them, and that’s why I love this easy Oven Baked Fish. You can swap out any vegetables you like—zucchini or yellow squash, bell peppers, vidalia onions—almost anything works in this recipe. For best results when making this baked fish, use a firm fish like salmon, halibut, cod, or grouper. 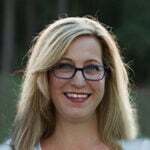 You could even use catfish if you can get it fresh. The best fish to bake is one that can hold up to high temperatures in the oven or on the grill if you want to put the foil packets on the grill. 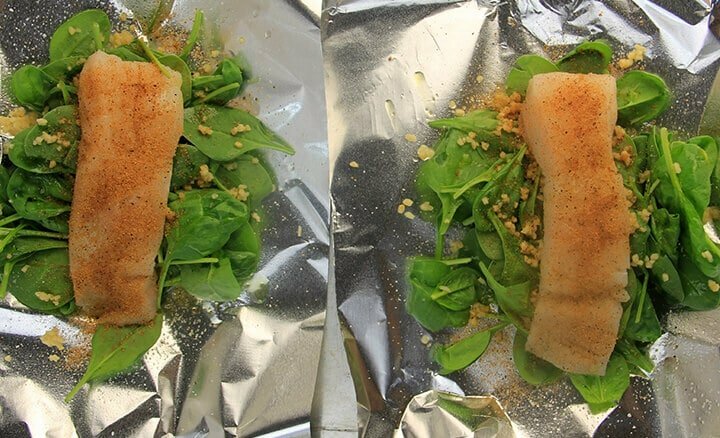 I like to use heavy duty foil for the oven baked fish, and place the foil packets on a baking sheet like this one in case the foil packets drip. The ingredients for this baked fish in foil recipe are simple and versatile. This is just a guide, and as I said previously, you can easily swap out the vegetables. You just want to be sure that you use vegetables that have similar cooking times and that will cook quickly so you don’t overcook the fish. 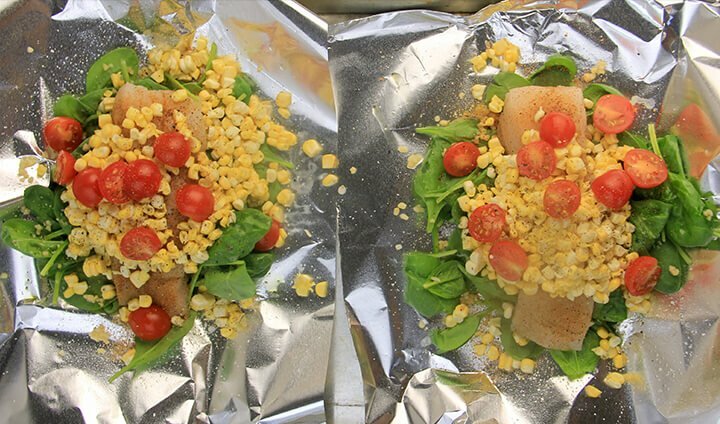 You can make this easy baked fish using foil or parchment paper as I did in this recipe. I don’t have a preference and just use whatever is handy. 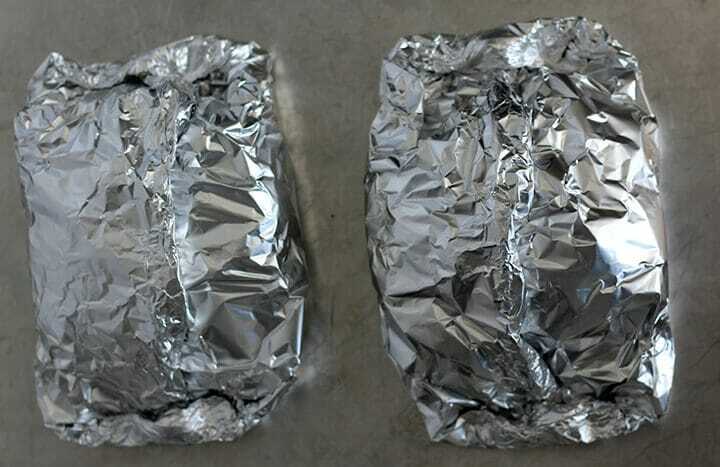 Foil is sometimes easier to make a packet with so when people ask how to bake fish, that’s usually what I tell them to use. Fish cooks quickly so plan ahead and have everything else ready. You want to be able to serve the oven baked fish as soon as it comes out of the oven. This is really a one-pot meal so to speak, but you might want to add a salad and if so just have the salad ready ahead of time. If I’m making this baked fish recipe for company, then I’ll have my table set, salad ready, and the fish packets made ahead of time so I can just pop the baking sheet in the oven after my guests arrive. 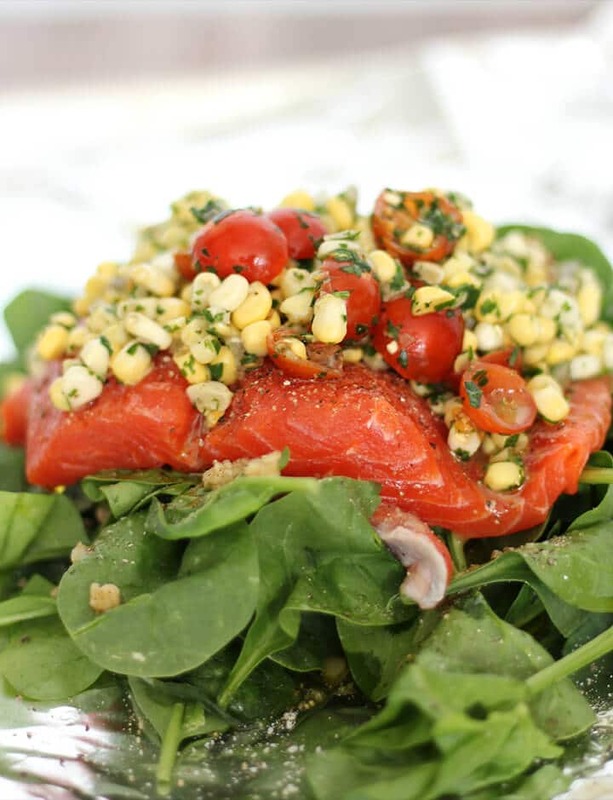 Toss the salad while the fish is cooking and when your packets come out of the oven you’re good to go. The fish will take about twenty minutes to bake. Lightly spray the foil and place spinach on each piece of foil. Sprinkle minced garlic over the spinach, add a little salt and pepper, and drizzle with olive oil. Place the fish fillets on top of the spinach and sprinkle each with Cajun seasoning. 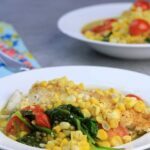 Stir together the corn, tomatoes, and parsley and spoon over the fish fillets. Sprinkle with salt and pepper and drizzle with olive oil. Fold foil over the center of the fish and twist together, then fold up each end and seal together. Place packets on baking sheet and bake for twenty minutes. Serve fish immediately, either in the foil packets or drain the juice and place on a plate. If you like this recipe, please leave a star rating on the recipe below by clicking on the 5 or 4 star! Thank you so much! Preheat oven to 400º. 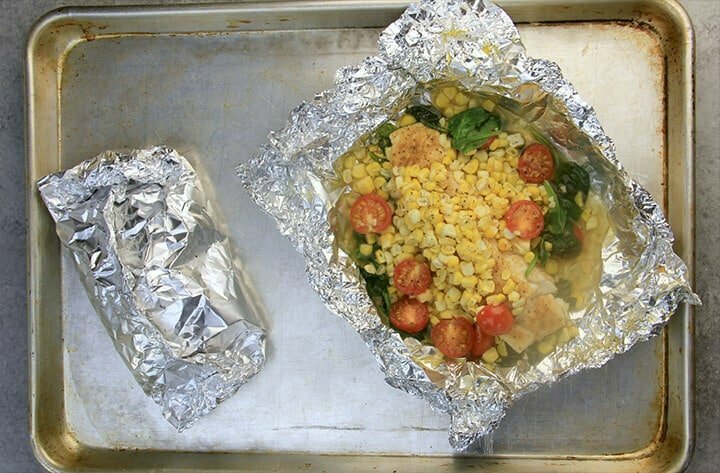 Lightly spray the foil and place 2 cups spinach on each piece of foil. Sprinkle 1/4 tablespoon minced garlic over the spinach, add a little salt and pepper, and drizzle with ¼ tablespoon olive oil. Place the fish fillets on top of the spinach and sprinkle each with ½ teaspoon Cajun seasoning. 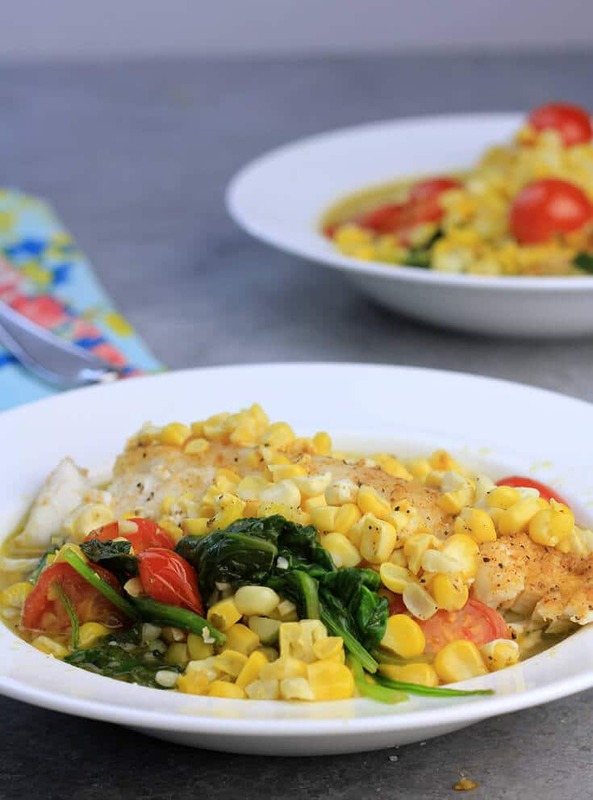 Stir together the corn, tomatoes, and parsley and spoon over the fish fillets. Sprinkle with salt and pepper and drizzle with ¼ tablespoon olive oil. Fold foil over the center of the fish and twist together, then fold up each end and seal together. Place packets on baking sheet and bake for twenty minutes. Remove baking sheet from oven. Serve fish immediately, either in the foil packets or drain the juice and place on a plate. Previous Post: « Baked Honey Mustard Chicken – Easy, Crispy, and Kid-Friendly!